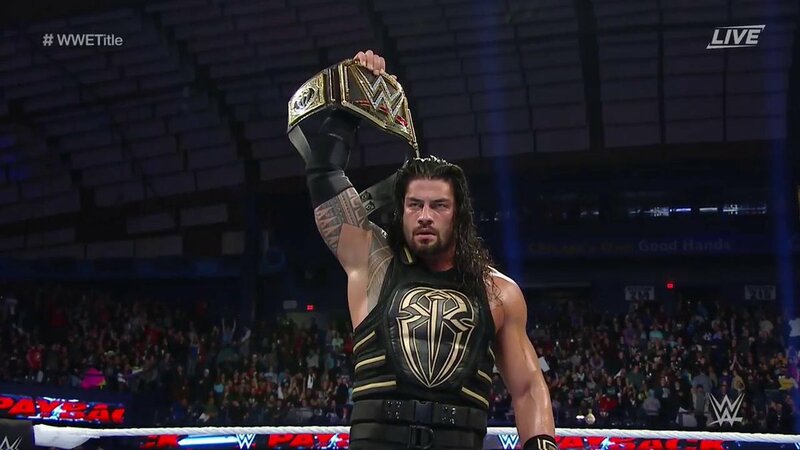 Roman Reigns kept a firm grip of his WWE World Heavyweight Championship as he made a successful first defence of his new crown with a victory over AJ Styles in a wild encounter in Chicago, on a night where the future of WWE was also determined by Vince McMahon's announcement. But the event was overshadowed by a horror injury sustained by Enzo Amore earlier in the night, where the tag team superstar, new to the main roster, suffered a concussion after striking the bottom rope with his neck which brought an abrupt end to the tag team tournament finals. To much relief for the WWE Universe, the concussion was the only symptom when he was checked into an Illinois medical facility. With the atmosphere drab after the shock incident, all superstars faced an uphill climb to lift spirits in the Allstate Arena, but they did with flying colours, with a terrific main event and spectacular matches prior to that, including the second coming of the Montreal screwjob (this time in Chicago), and war waged over the Intercontinental strap. But the night ended with one man rising above all. Roman Reigns was counted out and disqualified in his title match, but Shane and Stephanie McMahon both made adjustments to the match accordingly, right off the bat of their father Vince's announcement that both his children would share equal power of running the company. The Samoan star enlisted the help of The Usos after Luke Gallows and Karl Anderson got involved in the contest as the Champion looked to finish off AJ Styles. The Phenomenal One however gave Roman a real run for his money, with some vicious flying forearms and more, only to walk into a match-ending spear. However, that isn't the final chapter, as the management confirmed Styles will get a rematch at the next event, Extreme Rules. Who knows why Baron Corbin's pay-per-view singles debut was on the kickoff show, perhaps its testament to the stacked roster, or maybe someone didn't get the memo. Either way, The Lone Wolf was going to relish the occasion up against a former World Champion - of course until experience paid dividends. As the two stood face to face prior to the first bell of the night, the story was clear: the new recruit was going to dictate the pace while the Showoff did all he could to tilt things back in his favour. He managed to take the fight to Corbin in more ways than one; hitting a Famousser for a near fall and causing significant damage. But when Ziggler's risk didn't pay off, a leap from the steel steps to take out the big man from the air; he instead met the sole of his opponents boot, before being catapulted straight into the steel ring posts on the outside. However, Corbin made the error in admiring his own work, rather than finishing the job. When he did get back into the ring, he wasted more time, allowing Dolph Ziggler to recuperate and roll up the NXT star to hand him his first loss in the WWE, and start the night off with some puzzling booking. One half of the Lucha Dragons gave WWE a stern warning not to place him on the kickoff shows as he once again shone when asked of him en route to a marvellous tittle defence against Ryback, overcoming the grittty toughness of The Big Guy. More circumstantial viewers would have noticed that Ryback in fact saved Kalisto from what would have been a potentially catastrophic fall to the outside when attempting a springboard. The Human Wrecking Machine wasn't exactly making it a hospitable experience for his high flying opponent, however, doing all in the book from a thunderous spinebuster, to a smooth suplex from a DDT - but he was unable to finish convincingly with Shellshocked leaving the opportunity open for the champion. And when that opportunity came, Kalisto grabbed it with both hands. Just as the writing appeared to be on the wall when Ryback had him hoisted on the top rope, before throwing the United States Champion to the canvas, he appeared to be closing in on the gold. But the high risk move wouldn't pay off - Ryback looked to land a crossbody from the top, only for Kalisto to move out in ample time and nail the Salida del Sol to retain his championship. In what was a build that slipped under the radar en route to the event, Kalisto and Ryback certainly made up for a deficit in a contest which even exceeded their WrestleMania match, which was also on the kickoff show. That should now put a cap on that rivalry and Kalisto can try and evolve his run, while Ryback could do with a fresh feud to renew his big strength appeal. Typifying the new era ushered in after WrestleMania, The Vaudevillans and Enzo Amore and Big Cass were just one win away from getting a crack at the tag team champions, who were as comical as ever when they got the main card under way, from Booty-O's to unicorns and trumpets. All that jazz - literally. They observed from the sidelines as the two teams squared off having scaled to the top of the division in the tag tournament. But a deeply concerning injury not long through the match cut things short and the atmosphere inside the Allstate Arena quickly turned sombre. He was caught badly by the bottom rope and his head violently crashed against the canvas when launched by Simon Gotch and crashed to the outside. The referee immediately signalled for medical attention while tag partner Big Cass watched on in despair and that's where reality sunk in that this was a really worrying situation. The match was called off and Enzo was taken off on a stretcher. Later on in the evening, it would be revealed that the superstar was moving his fingers and toes, and also communicating on his way to the hospital. It just goes to show that this may be "entertainment", but "fake" does not justify it - these men and women put their lives on the line and if you think its all one big deceiving act then shame on you - it's monopoly with human life. Kevin Owens and Sami Zayn's storied rivalry didn't really capture everyone's imagination, but that was no hit on the quality of the contest. They lifted spirits around the arena, but the injury to Enzo Amore just a few minutes before still loomed large in memory. The fact that the two rivals managed to put on a sensational match considering the circumstances is testament to their spectacular in-ring skills. After taking some early punishment, the Underdog from the Underground was finally able to unleash some of the anger that had built up throughout the rivalry and NXT battles between the pair. The referee's calls to stop were ultimately futile as he unloaded in the corner before coming close to finishing off his opponent with a Blue Thunderbomb, only to be a near fall. Kevin Owens then delved into his inventory with a nice frogplash, again, only to get the 2 count. Things remained incredibly well-matched; on occasions neutralizing one another as two cannonballs in the bottom corner were responded to by a big drop from Zayn as Owens looked to tee up the pop-up powerbomb. When the action spilled beyond the ropes, Owens spine crashed onto the apron with a back body drop, before a DDT through the ropes from the outside. Just as it looked like the writing was on the wall, and the patented Helluva Kick was getting set up, Owens remained alert with a Pop Up Powerbomb, keeping his compatriot down for the three count and subsequently picking up a huge victory. However, KO wasn't done there - his rage wasn't fulfilled with a trademark win over his nemesis; he ordered Byron Saxton to ask him some questions on the microphone, after attacking Zayn further. Then, with the Intercontinental championship following up, Owens took the decision himself to take commentary duties. Even with an injured shoulder, Cesaro forced The Miz to tap out in their Intercontinental Championship bout. Thankfully for the A-lister, the referee's back was diverted to attend to another affiliated brawl outside the ring and when his attention was returned, the situation was different. That was the closing sequence to a match which excelled and achieved its goal of a quality midcard match if not beyond. The physicality favoured the European, who was able to unleash on his lethal uppercuts and rag doll the champion around the ring. That didn't mean that The Miz didn't have much of a shout in the contest, though, keeping the Swiss at an arms' length by repeated shots to the heavily taped shoulder. It would open up the opportunity to nail a Skull-Crushing Finale, of which the challenger kicked out. Things would really get messy when Sami Zayn stopped Kevin Owens from flapping his gums at the commentary desk. He came back for his arch rival after the post-match attack resulting in a brawl all around the area and even near the ring at one point. But while all that chaos was unfolding, Cesaro had the Crossface locked in just as Owens and Zayn traded on the apron. The referee was distracted with his back turned, and The Miz tapped out. As soon as Cesaro noticed the discrepancy, he pushed both men off the surface but that time window was enough for Miz to get his wits about him and roll the challenger up, holding the tights in the process to retain the championship. It was smartly done by WWE to intertwine these two feuds for what surely will be a Fatal-4-Way in the future. Cesaro put on a strong showing while The Miz sustains his heel character brilliantly by managing to weasel his way into victory. The next few weeks following this saga should be very interesting, and its a contrast of what either title means: just a year ago, the US championship was one of the hottest assets around with John Cena's open challenge and now its on the pre-show, while the roles have been reversed for the Intercontinental Championship with all comers vying for that strap. Dean Ambrose and Chris Jericho's feud had transpired over the invasion of talk shows and microphone work, but when the two settled their differences inside the ring, fireworks were certainly on display in Illinois - with the Lunatic Fringe hanging in there with the best to a cornerstone triumph as he took everything the rockstar could throw at him. A frantic pace set early by Ambrose was very hard for Jericho to deal with, being forced to race around the ring and from rope to rope before weathering the early storm and setting it at his methodical pace. A few slaps and suplexes later, the Canadian was in his element; before eventually vicing in the Walls of Jericho, taking its toll as it was sustained on his opponent for quite some time before reaching the bottom rope for some much needed salvation. Things would even spill beyond the four corners, with the German announcers' desk soon the platform for the next instalment to the battle. While the Lunatic was unable to hit a Dirty Deeds on the table, he did manage to use the surroundings to his favour, and his elbow drop from the top rope was close to finishing Jericho off. Jericho would rally back one more time, but when the Lionsault was blocked with the knees, that would set up for a definitive Dirty Deeds as Ambrose put Jericho away for the three count, letting him progress on his voyage back to the top while a furious Jericho unleashed his anger on the outside. If the creative department are insistent on making fresh feuds, this should be the last of this saga. Throughout her reign as Women's champion, Charlotte had relied on the underhand tactics of her father and WWE legend Ric Flair. But the odds were evened at Payback, as Natalya, the next challenger for the throne, brought the help of Bret Hart to her title bid. There was some early back and forth with wrestling fundamentals on full display as Charlotte was vocal with Wooooos and Natalya registered a few sharpshooter attempts as well. With the Hitman and the Nature Boy observing from close distance, it was the champion who looked to infiltrate the mentality of her opponent, with slaps to the face and continuous instigation in her attempt to extend her reign. She was soon put in a spot of bother when Natalya locked in an armbar, only for Charlotte to break out and keep her hopes alive. The two had a Figure-Four in the centre of the ring but that was far from the end, a moonsault later and more near falls would come to a pivotal moment, that ultimately was decided by referee Charles Robinson. As soon as Charlotte locked in the Sharpshooter, the referee rang the bell and it was determined a submission loss for Natalya. Things must have seemed far too familiar for Bret Hart who watched on from ringside reminiscing on his infamous incident back in 1997, as the referee handed Charlotte the belt while she celebrated with her father. The Harts would leave with the upperhand though, as Bret Hart punched Ric Flair and secured a Sharpshooter while his relative did the same to Charlotte at the same instance. They may not have walked away with the gold, but the Harts walked out on top. We hope that Enzo Amore makes a full and healthy recovery after his injury. But its good to hear that he was discharged from hospital diagnosed with concussion. And props to the superstars for carrying on the show brilliantly and Roman and AJ put on a classic main event.